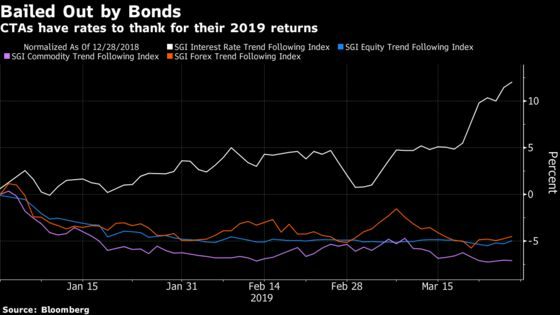 (Bloomberg) -- Quants surfing the momentum of assets around the world have caught the bullish wave powering government bonds in a tentative reprieve for the besieged $355 billion industry. 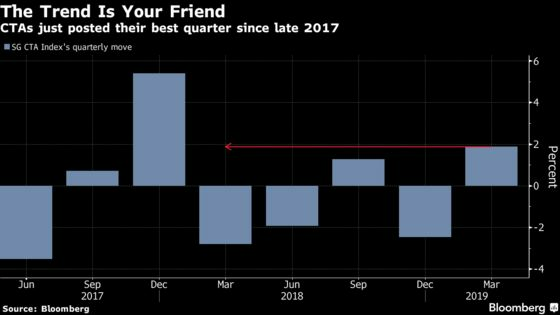 Trend followers, or commodity trading advisers, have posted their best quarter since late 2017 after recession panic juiced long wagers tracking interest-rate markets, according to a Societe Generale SA index of the largest funds. The bad news: They’re only up 1.9 percent, even as stocks and crude post their best first-quarter performance in over a decade. Automated traders have largely missed out on the biggest gains on offer as their trading signals flash caution after last year’s market meltdown. All told, whipsawing trends continue to dog the industry after the worst outflows in over 10 years in 2018. SocGen reckons this breed of quant is now modestly overweight stocks, neutral commodities and notably long bonds -- suggesting pain in the months ahead if risk assets rally on and Treasury bears emerge from hibernation en masse. Ten-year U.S. government bond yields have jumped over 10 basis points to 2.487 percent from the low reached last week. CTAs and macro hedge funds as a combined group on Credit Suisse Group AG’s prime brokerage have increased stock exposures in the futures market close to levels notched just before the brutal sell-off in the fourth quarter. With government bonds and risk assets sending conflicting signals on the business cycle, it’s unclear whether automated followers can ride decisive trends to catch up with hedge funds and the equity benchmark. After CTAs rose to fame by notching double-digit returns during the financial crisis, they’ve largely flopped ever since. The SocGen CTA Index has climbed just 11 percent over the past decade -- seven percentage points behind the HFRX Global Hedge Fund Index and a huge 232 percentage points behind the S&P 500. Trend followers, which manage more than $350 billion according to estimates from BarclayHedge, have become acutely vulnerable to short-lived trends. Blame it on monetary shifts spurring rallies and sell-offs in quick succession, rising idiosyncratic risks such as Brexit, or sleepy algorithms. Over at Transtrend BV, Andre Honig frets the outlook for the industry, notwithstanding the uplift from the bond rally of late. “The dynamics of markets evolve so quickly that CTA systems that have been fitted to the past will not be easily valid for the future,” according to the executive director at the $4.9 billion hedge fund. Transtrend’s Diversified Trend Program rose 6 percent in March, taking its 2019 gain to 3 percent. 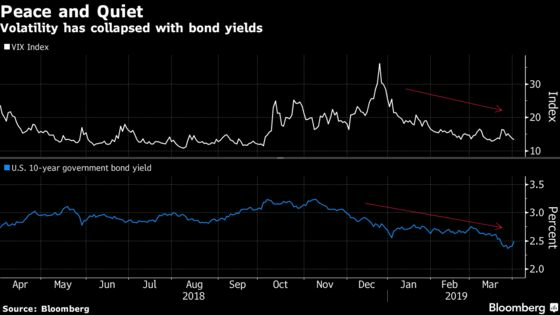 It’s long Australian and European bond futures, and betting in a relative-value trade that comparable U.S. debt obligations won’t rally as sharply. “Although we would welcome more trendiness, we must continue to try to see through the distortions in market prices,” said the quant investor. The fund is short on most commodities except for oil and isn’t building new bullish positions on U.S. stocks. It might take a sustained downswing to materially boost the industry’s fortunes. The quant firm has switched from being short almost every asset class last year to being positive on stocks and bonds in 2019, she added. While the bull run in rates may have boosted performance, the lower-rates-for-longer era caps returns from carry trades and collateral, according to Kaminski. Muted volatility fueled by dovish central banks can also encourage automated traders to boost leverage to reach return targets, a potentially risky proposition in the current environment. Campbell & Company, a quant with $3 billion, has levered up in the market tranquility, according to Brian Meloon, a cash-equities strategist at the firm.